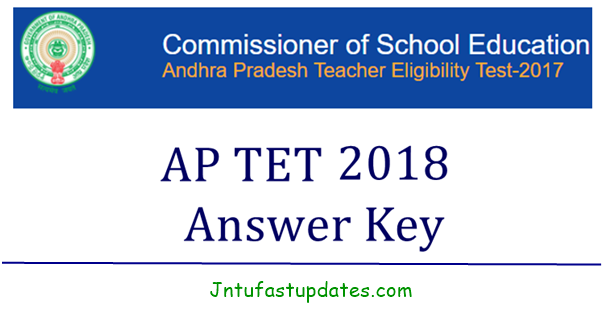 APTET Answer key 2018: Commissioner of School Education Andhra Pradesh has done with the process of conducting Teacher Eligibility Test (TET) Examination in the state in many examination centers. A huge number of applicants to be attempted the AP TET Paper 1 and Paper II in morning and afternoon shifts. The CSE Andhra Pradesh has conducted APTET Paper 1 Exam conducted From June 10th, 11th, 12th, 13th in morning shift from 9.30 am to 12 pm and afternoon shift from 2.30 pm to 5 pm and APTET paper 2A, 2B Exams will be conducted from June 14th, 15th, 17th, 18th, 19th in session 1 and session 2 timings. Andhra Pradesh Teacher Eligibility Test 2018 Final Answer keys, Responsive Sheets and Question papers are Available Now. Candidates aspiring to get teacher designation in schools of Andhra Pradesh have given the test as per the schedule. All the hopefuls are hereby informed that the AP TET answer key for June 10th to 19th Examination is accessible to download on manabadi.com and various other portals. Candidates need to visit the Official website of AP TET, aptet.apcfss.in to download AP TET answer key 2018 PDF (Official). By visiting the portal candidates will be able to download AP TET answer key for set A, B, B, D for both paper I and Paper IIA, IIB. Candidates can go through the article to know more details regarding the Andhra Pradesh TET answer key for Paper 1 and Paper 2. APTET Result 2018 – Available on June 30. Search for AP TET 2018 Answer Key PDF link on the home page and then click it. You can download APTET Answer key 2018 for Paper 1 & Paper 2A, Paper 2B for all sets and check the answers of the exam you have written. 1.3 How to Download AP TET Answer Sheet Key Solutions 2018 Online? Sir June 11 morning section not matced. Sgt paper please check Sir. All are miss matched please check sir. Sir, Is it true whether they will add the grace marks for all the APTET Candidates. Please confirm it.